Yep, remote from day one. Remote is a core part of the way we run as a company, but I wouldn’t necessarily call it a part of our “business model” in the financial sense. We were remote from the start, and the main reason was simply that I didn’t find the team I wanted locally, so I began looking around the world for the best talent available. Nearly four years later, here we are. Candidates must have experience working remotely or running their own business. They have to have already built the accountability and productivity skills required for remote work. We’re very open about it on our blog, and that’s where most of our new employees find us, so it’s pretty front and center. 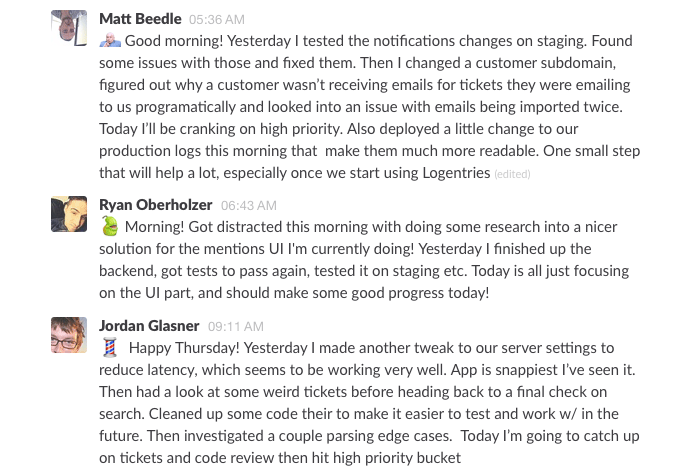 We have daily standups in Slack and standards for answering customer support tickets, but other than that, we haven’t had to set any other rules in place. Our team knows how important communication is and how important everyone’s time is, so it hasn’t been an issue. It was completely organic; our very first employees were remote. Look for employees with experience working remote or running their business. A great developer (to use one example) isn’t necessarily a great remote developer. Remote working is a skill like any other, and you need to hire for it. Communicate. Communicate. Communicate. Schedule team calls and one-on-ones very regularly, and not just about work. Help the team get to know each other just like they would around a real water cooler. Slack, weekly team Skype calls, biweekly one-on-ones, and with private notes in Groove. I live across the street from the beach, so taking frequent breaks is easy. Plus my dog, Honey Badger, tells me when it’s time to go outside. Best is from any beach 🙂 Worst is probably the floor of any airport.